Topic: What are the vehicles in Grip called? Re: What are the vehicles in Grip called? It places emphasis on the ‘combat’ and the ‘car’. This is, after all, a combat racer. And you have to love the nod to the legacy. But fair is fair - will wait to see it complete and on the track. You could play around with weapon charge and cool-down time as a balancer rather than mess with vehicle speed and momentum. So you have access to a more powerful weapon but it ends up filling that pickup slot for a longer amount of time, decreasing weapon turnover as the balancer. Queadah, these icons are awesome. 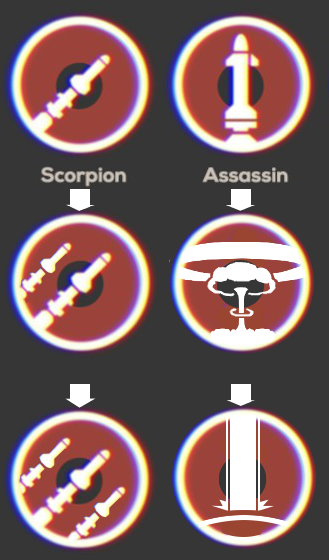 I think you should have a shot at the disrupters icon... for me it’s not quite consistent with the others in the game. What do you think? Could we see tank style tracks in the game? May hide some of those awkward physics interactions with unfinished/unpolished out of site geometry if you just hold the camera back and watch the vehicle fly off.